(CNN) -- President Nicolas Sarkozy tried to reassure France Wednesday that his health was in no danger following an emergency trip to a hospital on Sunday. French President Nicolas Sarkozy Wednesday told reporters he was in good health. 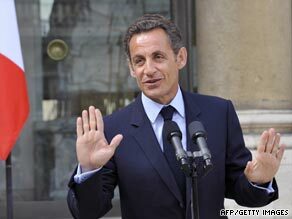 "I would like to say to the people of France that my health is good," said Sarkozy. "What happened to me can happen to anyone," he told reporters after a Cabinet meeting Wednesday. The remarks to the media, which are unusual after a Cabinet meeting, were the first time he had spoken to journalists since the scare. Sarkozy, 54, said he would go on vacation in the south of France for "a few weeks of well-deserved rest." A message on Sarkozy's Facebook site Tuesday said, "I am doing really well after Sunday's little incident, which entices me to rest this summer." He also thanked his 131,437 Facebook fans for their support, prompting thousands of comments, including "jogging is great but when it's colder Mister President." Sarkozy was released from a hospital Monday, with doctors saying a combination of heat and too much work caused him to feel unwell while jogging over the weekend. Blood tests, along with a brain scan and an electrocardiogram, detected nothing abnormal, doctors said. They did not prescribe a medical treatment for Sarkozy, but recommended he rest for several days. As a result, Sarkozy delayed a visit to the Mont Saint Michel abbey in Normandy that was to have taken place Tuesday. Sarkozy had been jogging Sunday with bodyguards for about 45 minutes near the Palace of Versailles, in the vicinity of a presidential residence, when he fell ill. He did not lose consciousness. After being seen by a doctor, Sarkozy was taken by helicopter to the military hospital Val-de-Grace. Sarkozy exercises regularly and is an avid jogger. Earlier this month, he was photographed jogging through Central Park in New York during his trip to the United States. CNN's Flora Genoux and Jim Bittermann contributed to this report.